Lawmakers in Nevada and New York advanced key medical marijuana legislation on Monday, raising hopes that dispensaries will be able to open in both states and setting the stage for what could turn out to be a blockbuster month for medical cannabis. In Nevada, a bill to enhance the state’s longstanding medical marijuana laws by allowing dispensaries to open cleared the Assembly and appears headed for the governor’s desk. Under the measure – Senate Bill 374 – a varying number of dispensaries could open in each county based on population, with a maximum of 40 in Clark County (which includes Las Vegas). Up to 10 dispensaries could launch in counties with a population of between 100,000 and 700,000, two in counties with 55,000-100,000 residents and one in smaller counties. Nevada Gov. Brian Sandoval has come out against recreational marijuana use but said he is open to the idea of allowing dispensaries, so there’s a good chance he will give it the green light. Sandoval will have until mid-month to sign or veto the measure. In New York, the state Assembly passed a bill on Monday to legalize medical marijuana by a wide margin, with 95 lawmakers voting in favor of it vs. just 38 who shot it down. Just as impressively, the measure gained bi-partisan support. It now heads to the Senate, which has until the current session ends on June 20 to weigh in. If the bill passes, dozens of dispensaries could open up across the state. 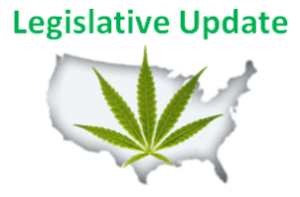 The bill – sponsored by Gottfried and Sen. Diane Savino – aims to head off the problems seen in other states with weak medical marijuana regulations by incorporating stringent rules on everything from dispensary applications to inventory tracking requirements. It also calls for an excise tax on marijuana manufacturing and sales, with a good chunk of the revenues going toward local municipalities. The main challenge now will be getting the measure up for a vote in the Senate and, if it passes, convincing a somewhat skeptical governor to sign it into law. A similar bill to legalize medical marijuana has also cleared the Illinois legislature and now awaits the governor’s signature. If all three measures pass – and there’s a chance they all could this month – the medical marijuana industry will grow by leaps and bounds in the coming years, leading to thousands of jobs and hundreds of millions of dollars in additional revenues.